*Bloggies is not responsible for making you more or less intelligent and will most likely just rot your teeth (as said on the side of the box). 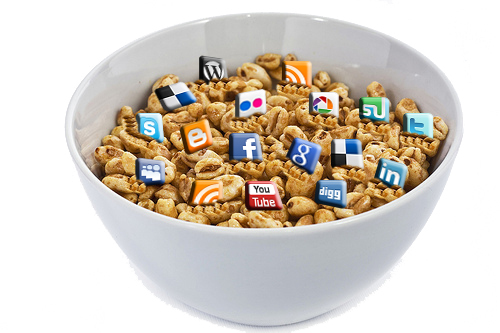 Ridiculous sales pitch aside, the idea for the cereal is to have a honey glazed cereal mixed in with marshmallows that represent some of the most popular social media web icons today. Delicious.com making you feel hungry? 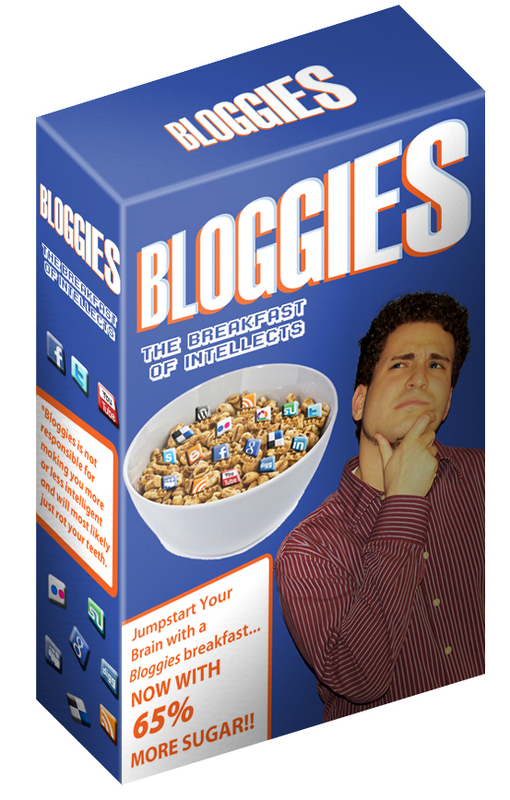 Grab a box of Bloggies while you surf the web. For the purposes of the cereal, I’ve decided to be completely selfish and throw myself on the first cover…not to say there are not dozens of potential covers featuring icons of the web, social media and technology. For this idea, I decided to use the Vanishing Point to give the 3-D perspective for the box. Basically this entailed creating three separate layers for each panel of the box. To help guide me, I created an outline for the box using the pen tool, then was able to transform the perspective of the panels within the Vanishing Point window. For each one of the panels, I added in a texture (from blending mode) and added in a light shadow (along with an angle for the shadow) to give it a sense of perspective. The tool definitely takes some playing around with to get used to, but helped make the box look a bit more authentic. For the marshmallows, I used free icons that I was able to download and layered them into the cereal. I get an RSS feed from the site, youthedesigner.com and they provide different types of social media icons…everything from icons that look like soda caps to ice cream bars to even origami…everything that is, except marshmallows. To get that look, I dragged in the standard square icon layers to the cereal bowl and in each layer I went into blend mode, added an inner bevel and then added a contour to give the icon almost a 3-D angle, to represent a small marshmallow. To have the icons (now “marshmallows”) lay in the cereal; I transformed each layer with either a perspective, skew, rotate and/or scale tool, depending on where the layer was in the bowl. To have the marshmallows actually look like they were part of the cereal, I used the clone stamp tool to copy a part of the cereal itself and created another layer that I used to clone some of the cereal over and around the marshmallows to make it look more realistic (or as realistic as social media icons in a bowl of cereal can look). For the logo itself, I wanted to have that familiar Wheaties look, but with a twist. I created the Bloggies font in a very similar fashion to the Wheaties version (Haettenschweiler font). I then took the text, converted it to a smart object and then skewed the font to give it the angle that the Wheaties logo has. I then added a stroke and inner shadow to capture the other colors in the logo. To give it that “opposite” look, I reversed the colors (blue as the background, orange as the stroke in the letters). The subhead, The Breakfast of Intellects was used with Karmatic Arcade to convey a kind of an old-school, 8-bit technology effect. Overall, it was a fun project to create, although a lot of detail went into this. While the cut-out of my picture was relatively easy and the logo font took a little research, the detail in the cereal was very time consuming. I have always been one to notice logos (especially in cereal), so I figured why not combine the social media icons I see everyday into a breakfast cereal? I went light with the tone (as usual) and for some silly reason, the downright campy title of Bloggies for a cereal made me chuckle, so I kept it (still better than Webbies, Brainies or even worse, Foodpress). All in all, I am relatively pleased with the end result. 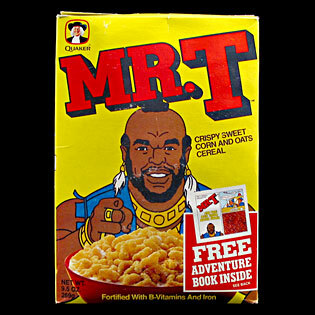 After all, doesn’t everyone deserve their own cereal cover?